When discussing the difference between ink and toner, it must first be taken into consideration that the printers and printing processes associated with them are fundamentally different. Toner is a powder that is used by laser printers; whereas ink is a liquid that is used by inkjet printers. While clearly there is no best choice, a brief review of the printing processes as well as advantages and disadvantages of each will help you to decide which is right for you. Inside a laser printer is a rotating drum. The computer sends the image you want printed to the printer, and a laser draws it onto this drum; this laser alters the electric charge on the drum in the places where the image was made. Toner – a powder consisting mainly of iron oxide and plastic resin – is then applied to the drum, but it only adheres to the places where the laser drew the image. The paper, also electrically charged, then rolls across the drum, and the toner is transferred to the paper. A hot fuser then “melts” the toner into the paper so it won’t smear or smudge. An inkjet printer contains various airtight cartridges that are filled with liquid ink. They are attached to a print head, which has many tiny ink nozzles. As the print head moves back and forth across the paper, small droplets of ink are applied to the paper – thousands per second – through the nozzles, creating the image that you sent from your computer. Quality: The precision of a laser printer, which uses toner, is hard to beat since it generally produces sharper, higher quality images. The microscopic pixels of ink sprayed by inkjet printers can’t quite match the quality of laser technology. While photo-grade inkjet printers are capable of producing exceptionally high quality photographs, this isn’t always the case, and they can be expensive. And ink from inkjet printers can smear and smudge. If similar printers are compared, the laser printer has the edge on quality. Cost: When comparing costs, there are two factors to consider: the printers and the ink/toner they use. Startup costs for inkjet printers are considerably less. Plus, the printers themselves are less expensive, as are the ink cartridges for them. While it may seem that the inkjet has the obvious advantage, inkjet cartridges must be replaced much more often than toner cartridges. Therefore, the initial higher cost for a toner cartridge is a better investment. If you do the math, you’ll see that toner ends up costing less per printed sheet. Ease of Use: When it comes to replacing cartridges, inkjets have a slight advantage. They are small, there is no mess, and they just snap in and out. 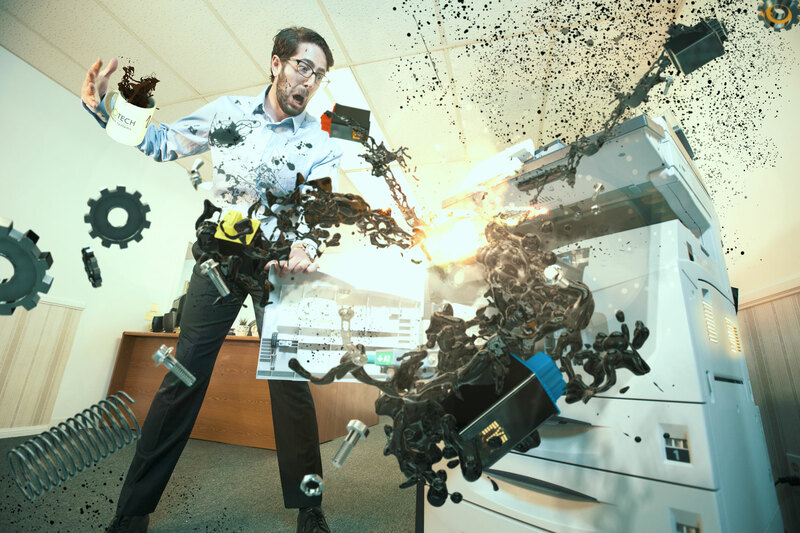 Toner cartridges can be somewhat messy and more difficult to replace. However, since inkjet cartridges contain liquid, the ink can dry and clog the nozzles, especially if the printer sits for a while without being used. While most printers have built-in cleaners, this possibility still exists. There is no such concern with toner. This question can only be answered by you. What do you need the printer for? If you only print documents once in a while, an inkjet printer may suit your needs. But if you print a high volume of documents in a business – such as an auto dealership – or if you require high quality copies, then a laser printer may be a better choice. Protech Business Systems in Los Angeles can help you choose the best printer for your needs.